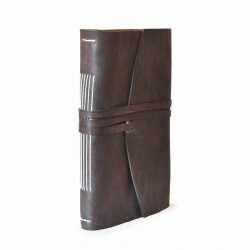 Leather journal with inner paper from Amalfi. The Amalfi paper is a paper Made Entirely by hand , built to last in the time. /> The production is According to ancient techniques of master papermakers of Amalfi . /> This paper is ideal for the artists and designers and all the writers. It is rough and heavy.